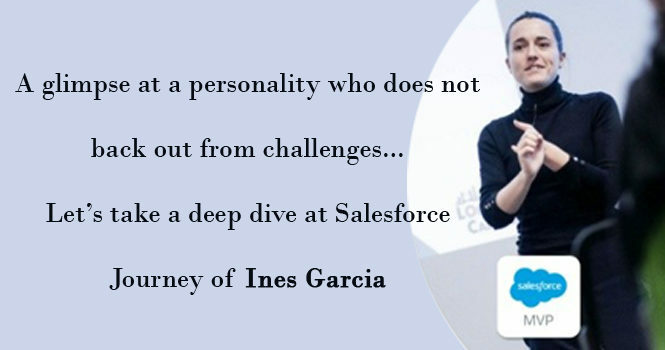 It was a great experience for me when I learned about Leyna’s stimulating drive for Salesforce. I instantly knew her career journey was meant to be shared and finally I could pen down, with her help obviously, her story. So here’s the story of one of the first women MVP’s of Salesforce – Leyna Hoffer. Leyna Hoffer didn’t start her career in Salesforce and became an Accidental Admin in 2002 when her company, where she worked as a Database Coordinator, decided to purchase Salesforce as their CRM for Sales & Marketing, They needed someone to take on the configuration and administration. She raised her hand and started this wild ride into the world of Salesforce. Leyna quickly realized that Salesforce was not only a piece of software to learn, but it was also a real passion for her. Although she didn’t fully comprehend it at the time, Salesforce was setting her on a completely new career path. One in which she would truly thrive and assist other girls in technology. To begin learning she started attending the Admin 201 class in San Francisco, and unwittingly began forging relationships with people that would shape her career in the years to come. Her instructor was none other than Erica Kuhl, who is currently the VP of Community at Salesforce. In her new organization, Leyna expanded her knowledge in Salesforce by focusing on Sales, Marketing, Customer Service and integrating it with the back-end systems. 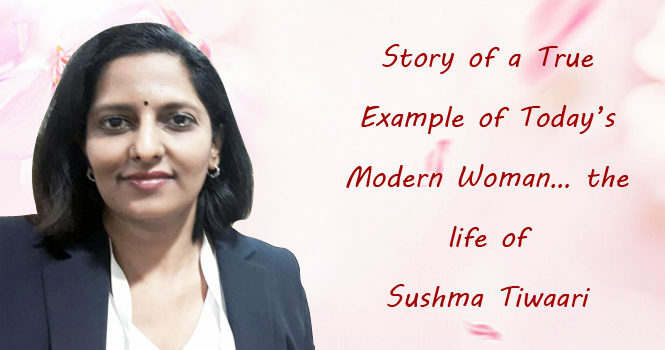 At that point in time, she learned about the Salesforce Community and started participating in user groups and discovered that sharing knowledge was the medium of great learning. She emerged as one of the co-leaders of the group and started planning and executing the bi-monthly meetings. This proved to be a turning point in her career and she extended her reach as an admin. She began using AppExchange to discover answers to partner solutions as well as free solutions and then customization to fit business needs. She devised appropriate solutions by downloading apps, giving feedback, guiding others through the user group. 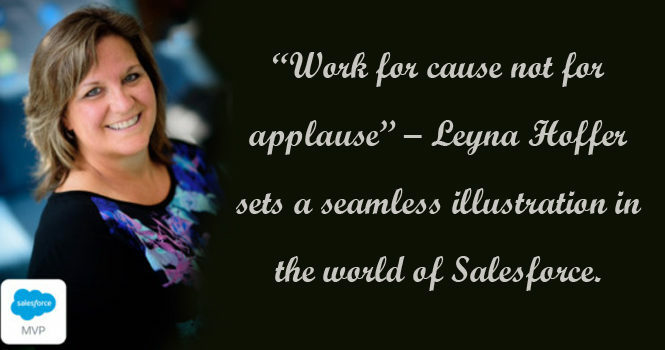 “A dream doesn’t become a reality through magic; it takes sweat, determination, and hard work.” Leyna proved it in Dreamforce 2008 when Salesforce recognized her as one of their AppExchange All-Stars. This gave her an opportunity to meet and link with renowned personalities in Salesforce and learn what solutions they were using in their Salesforce orgs which prolonged her knowledge. At 2009’s Dreamforce, she was one of the first 18 individuals recognized as Salesforce MVP – a program where Salesforce identifies people based on their accessibility, responsiveness, knowledge, leadership, and credibility within the community. Leyna is one of the first 500 Certified Admins. She has since received several more certifications; Advanced Salesforce Administrator, Force.com Developer, Platform App Builder, Marketing Cloud Email Specialist, Sales Cloud Consultant, and Service Cloud Consultant. She thinks of her to be fortunate to be part of several new Salesforce adventures – Global CRM Director for a customer company, Sr. Business Analyst for a Salesforce consulting company, and now her current position of CRM Success Manager at Edmentum. This position is fast-paced, challenging, and uses all the skills that she has acquired over the past 15+ years. Leyna Hoffer is deeply inspired by Erica Kuhl, VP of Community at Salesforce, from Women in Business perspective. Leyna believes that Erica has shown her what it is to have a vision and go for it. She wants to be the same motivation to all young girls who aspire to be in Salesforce, has the desire to work hard and possess the spirit of learning. Leyna is always keen to contribute towards Salesforce. She was the leader of the Twin Cities User Group for 9 years and organized Midwest Dreamin’ for 3 years. She has also spoken at several community events and as well as at Dreamforce. 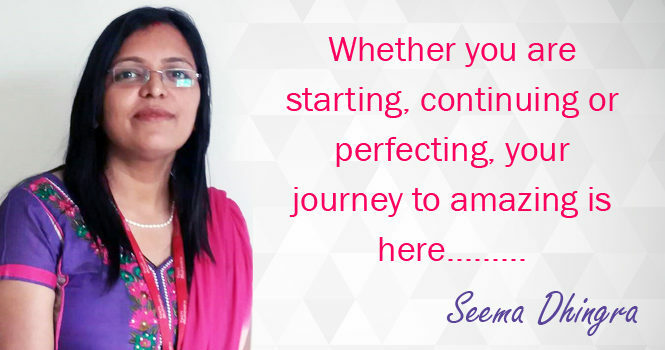 She mentors new upcoming admins and is always willing to do what Salesforce has done for her and towards boosting her career over the past 16+ years in Salesforce. Leyna is trying her best to give back to the community from where she has learned a lot. 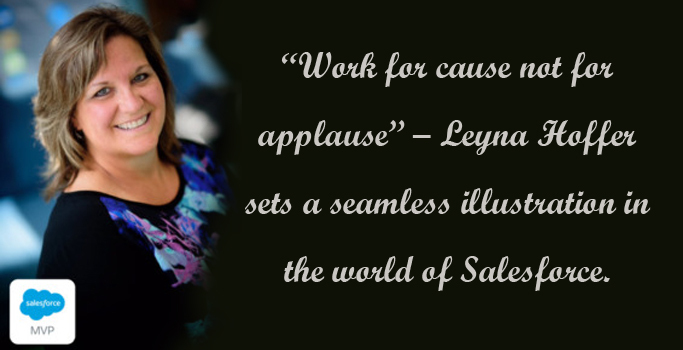 So, let’s give up a big cheer for Leyna Hoffer and the spirit of Salesforce Ohana.